You are here: Home / General / How Much Can You Earn Without Paying Taxes On Social Security? CAUTION: This column was written in 2016 and has been updated for 2018. You may reader comments below from earlier years. In another post I discussed how much someone can earn without having to file a federal tax return. I suggest you go back and look at that post first. Then I looked at North Carolina income tax filing requirements. They’re short posts! You now realize Mom has to file a tax return because her gross income exceeds $13,600. Recall, if her income exceeds $8,750 she’ll need to file a North Carolina return, but North Carolina does not tax Social Security benefits, so we’re focusing on the feds. If her non-Social Security income from all sources is more than $13,600, then she will have to file a tax return HOWEVER if ½ her Social Security benefits PLUS her income from all other sources is LESS than $25,000 (call it her “Combined Income”), her Social Security benefits will not be taxed at all. However, if her Combined Income (½ her Social Security benefits PLUS her income from all other sources) is greater than $25,000, then her Social Security benefits are going to be taxed to some extent. The question is: If her Social Security is going to be taxed, just how much? As a rule of thumb, if her Combined Income is between $25,000 and $34,000, then as much as 50% of the Social Security benefits will be considered taxable. If her Combined Income is more than $34,000, then as much as 85% of her Social Security benefits will be considered taxable. NO! That does not mean that she must pay 50% or 85% of her benefits as taxes . . . it means that up to 50% or 85% of her benefits will be treated like taxable income from other sources (after having pushed through a worksheet, which I’ll discuss below). To figure out the amount of benefits taxable, fill out the Social Security Benefits Worksheet that comes in the instruction package for Form 1040. Example: Let’s say Mom worked constantly at Burt’s FastBurger and her W-2 shows gross income of $23,000. Her 1099-INTs show interest income of $3,000. Her 1099-SSA shows Social Security benefits of $19,200. Half her Social Security benefits is $9,600. When added to her other income ($26,000) the sum is $35,600 . . . which is, of course, more than $25,000 in fact, it’s more than $34,000). All that means is some of her Social Security will be taxed. In fact, just for giggles I filled out a worksheet for Mom and you can download it here. As you can see, $5,860 of Mom’s Social Security benefits are taxable. That means that Mom’s gross income for the year will be: $23,000 (Burt’s) + $3,000 (Interest on the CDs) + $5,860 (Taxable part of Social Security) = $31,860. What If You Are Drawing On An IRA? Many people are drawing money out of IRAs. In fact, occasionally it may be necessary to cash in an IRA in order to qualify for Medicaid. How will IRA funds affect the taxation of Social Security benefits? Let’s change the facts a bit. Mom is not working. Mom and Dad have combined Social Security benefits of $25,000. Dad has an IRA, but because he is going into a nursing home they cashed in his $100,000 IRA. All of the IRA funds will be taxable on Mom’s and Dad’s joint tax return. The question is: How much of their Social Security will be taxable? Their Combined Income is $112,500 (1/2 of $25,000 + $100,000). Clearly 85% of their Social Security ($21,250) will be considered gross income when calculating taxes. Without any adjustments, their gross income is $121,250. Just for fun, I have completed a Social Security worksheet for this example for your viewing pleasure. By the way, this may not be a happy tax result, but Mom’s alternative was to start paying $9,500 a month to the nursing home on their, perhaps, meager savings. Can an in-law take advantage of mother in-law’s social security check which is automatically deposited into the mother in-law’s checking account? Look forward to your opinion asap. 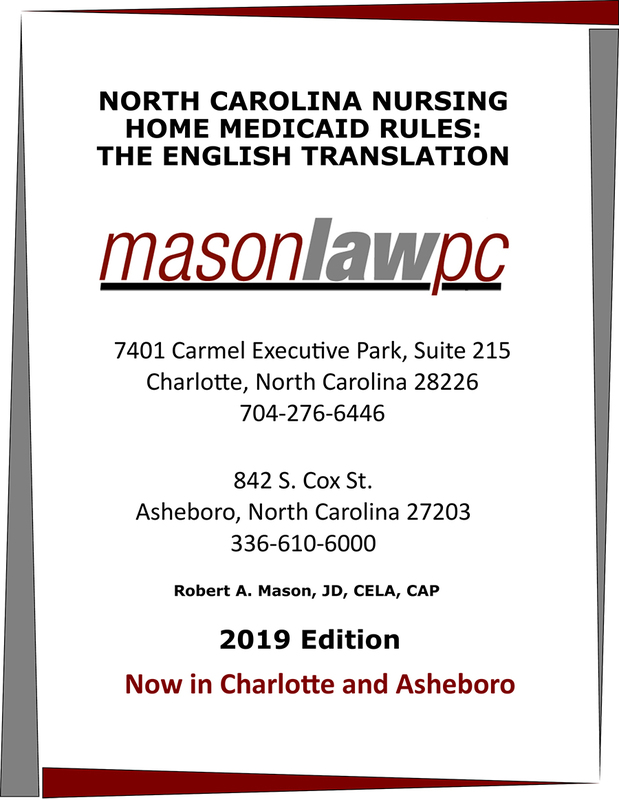 Thank you in advance for helping we seniors keep up to date with the latest regarding NC Law for all of us. From what I can tell from your question, “take advantage of mother’s Social Security check” sounds like elder financial abuse. If so, that is a violation of NC criminal law, not to mention federal (with Social Security involved). would that affect the trust I set up for him or his medicaid benefits or the ability to pass the remainder of his trust to his disabled sister when he dies? I anxiously await your comments. Thank you for your newsletters and the time it takes to write them. As far as co-signing, it won’t hurt your son, it’s really up to the bank as to whether it will accept the co-signature. Mr. Mason, I first want to thank you for helping us seniors out! My son receives SSI and now since I waited till age 66 for full SS retirement (2016) I and my wife are receiving SS (she gets part of mine high is her only income since she can’t work and takes care of my Autistic son). I’m retired military living in NC. My only income is (approximately $24k) from my Military retirement and now receive my SS ($16k). My question is regarding federal and NC state taxes since my wife and I file jointly. – Do we have to pay NC state tax on our social security? – How much must we pay Federal tax for our combined income? Thank you so very much for any help or advice you could give us!! Mac: I can’t really answer exactly because your situation could vary. That being said, you’ll have to file a federal return (assuming you file joint return) because your GROSS income is over $22,050 (if your wife is over 65 as well, that goes up to $23,300) . .. but your gross income is about $40,000 (including SS benefits). BUT, I doubt any of your SS benefits are taxable because your non-SSA income is less than $25,000 (for a single person; $32,000 for joint filers). And yes, you’ll have to file a NC return, but the taxation of your SS benefits should be negligible (if any). I found your website while looking for information on whether my grandmother would need to file a tax return. My mother passed away last year and I am now my grandmother’s POA, SS payee and applying for her OEM annuity representative. In 2017, she earned $8,988 in SS and $7,943.64 in annuity payments. She is widowed and would be filing a single return. Based on the very informative information above, I believe she would be exempt from filing, since her other than SS income is less than $11,850 and $8,250. Is this correct? Also, in applying for her OEM representative, it asked if how much tax should be withheld from the annuity and to send in an updated W-4. If she currently falls below the threshold to have to file a return, is there any benefit in withholding taxes from the annuity? I am new to this, but want to make sure I do all the right steps in taking care of her financials, so thank you in advance for any help you have to my above questions. She doesn’t have a federal filing requirement UNLESS she has a state filing requirement (I don’t know what your state may require). In any event, if she has a state filing requirement, she may have to file a federal return. On the otherhand, if she does not have a state filing requirement, she does not have a federal one, nor will she owe anything to the feds. Why have any withholding when she won’t owe anything? If you have withholding, you’ll certainly have to file a return to claim a refund.